On May 16, 2018 at the Georgian National Academy of Sciences the Embassy of Turkmenistan in Georgia jointly with the Georgian National Academy of Sciences organized a conference titled “Turkmenistan-the heart of the Great Silk Road”. 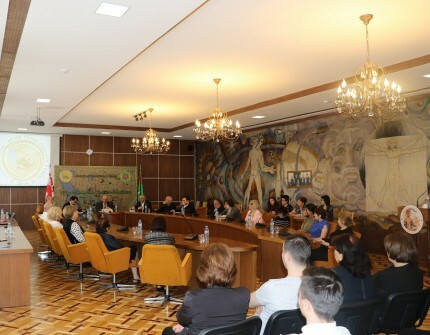 The conference was attended by the representatives of Diplomatic Missions and International Organizations accredited to Georgia, representatives of Academia, higher education students, as well as representatives of local media. The President of the Georgian National Academy of Sciences G.Kvesitadze, Ambassador of Turkmenistan to Georgia D.Muratov, political scientist, honorary journalist of Georgia B.Nachkebia, professor of Ivane Javakhishvili Tbilisi State University L.Metreveli and others delivered speeches at the conference. Noting that 2018 is held in Turkmenistan under the motto “Turkmenistan - the heart of the Great Silk Road”, the speakers underlined that throughout many centuries the territory of Turkmenistan served as a crossroad of Eurasian routes, the meeting point for cultures, civilizations, customs and traditions. It was also said that with the successful implementation by Turkmenistan the largest transport projects of the century, modern history is being written and the idea of reviving the Great Silk Road, which heart is independent neutral Turkmenistan, is being re-read. The speakers also noted that Turkmenistan turns into important intersection of the railroads, large transport and transit center of Eurasia and stressed the importance of the launch of the next stage of the Turkmenistan-Afghanistan-Pakistan-India (TAPI) gas pipeline, fiber optic networks in this direction, the laying of the Turkmenistan-Afghanistan-Pakistan power line and the opening of the new railroad along the route Serhetabat-Turgundi. The special attention was paid to the opening of the Turkmenbashi International Seaport. It was emphasized that this big infrastructural project has strategic importance for all countries of Central Asia and Caspian basin as its realization brings out states to new level of relations supporting their active integration into international system of economic relations and improvement of the role of Turkmenistan as important center of transit communications. At the end of the event the participants were presented the book of President of Turkmenistan Gurbanguly Berdimuhamedov “Turkmenistan – the heart of the Great Silk Road” as a gift. The video about the latest achievements of the independent neutral Turkmenistan was shown to the participants.